So many shows to be excited about this fall! These are particularly promising. Group exhibition of artists whose work spans print and ceramic media. Curated by fellow Bronx AIMer Sarah Rowe and Rachel Sydlowski. I have to catch this show before it closes! Group show on appropriated photography including Hank Willis Thomas and Matt Lipps. The venerable new media pioneer. One-fifth of BROLAB inaugurates the new digs of the artist-run alternative space of Jennifer Dalton and Jennifer McCoy. See @auxproj on Twitter for more info. (Full disclosure: helping out with this installation.) I think it’s an effective, provocative intervention. A gazillion studios in these seriously massive old buildings, whose awe-inspiring scale alone are worth the trip. Also check out studios of Bronx AIMer Brian Zegeer and CCA alum Carl Auge. 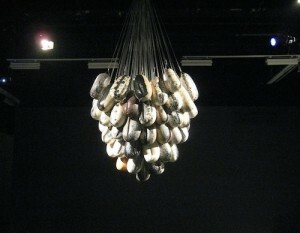 Affective installation of theatrically-lit ceramic and glass chandeliers (one, bomb-like breasts; another, womb-like cowry shells), sculptures, and two videos. One of the two figurative works is composed from vessels and suggests forced labor; the show is beautifully crafted and wholly discomfiting. I couldn’t stop examining David Reid’s gold luster tile at La Mama La Galleria (in Mixed Messages, a Visual Aids show through July 3, including Leveller* by Amanda Curreri). Have a look at the Luster Tiles series. The materials are baffling: it looks like a solid brass plaque from the side, but the front looks like a front-surface gold mirror with milk glass fused in, but the face is super smooth, in a continuous surface. It’s actually glazed porcelain, so I guess the sense of depth comes from the reflective gold next to the translucent white. It’s really neat, and surprisingly affordably priced. Put Showtime on my wish list!